You can get so exact that you immobilize yourself with accuracy. I joke about it. You buy this square, and you pay $400 for it and it's accurate to a 10,000th of an inch. Then all you've got to do is get yourself a job with Boeing building 747's and it's great. It's want you want, but it's not a woodworker's measurement and it never will be. I had an argument with a friend who is a highly talented furniture maker about accuracy in woodworking. I quoted the above statement and guess what he pulled out of his apron pocket? Yep, a square that was accurate to a 10,000th of an inch. He got a little sore at me when I laughed at his square and then I asked him, "Really? Why be that accurate? Your breath on that piece of wood will cause it to swell that much in the blink of an eye!" It took a month before he would talk to me again. I get very impatient with people who ask me how I can be accurate with hand tools. A year ago I had to block a person's email to me because they pestered me so much asking "how can you make guitars without power tools? It is impossible to do so!" What I really wanted to ask that person was this, "How did Antonio Stradivari create such wonderful musical instruments without a workshop stuffed full of the latest, greatest power tools?" I didn't ask that question because that argument wasn't worth my time. 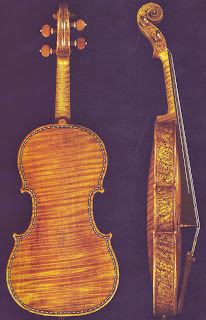 This photograph is from Violin Making by Walter H. Mayson, which can be found here. 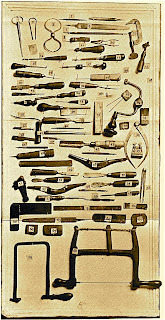 These are some of the tools that he mentions in his book, I notice that there are no planes in this collection. Even today, the great violin makers use hand tools such as these. 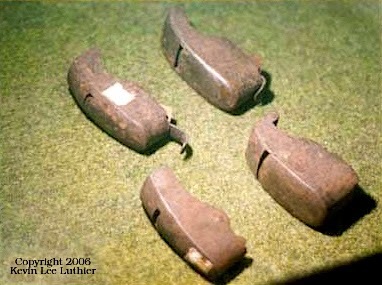 These are Stradivari's original planes. 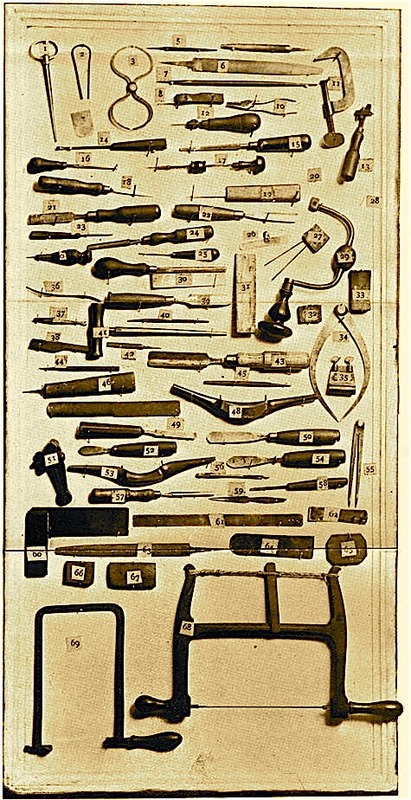 More of his tools can be found here. Pretty simple and I am sure that he made them himself instead of ordering them over the Internet from Garret Wade. I love making classical guitars and when I do make a guitar I want to listen to the wood. I want it to tell me something about myself so I can find the voice it wants. To help with that, I limit my use of power tools. I use a Dremel for cutting out rosette channels, a table saw for ripping out saddle slots on the bridge, a drill press to drill four holes in the head stock so I can cut out the slots for the tuners, a Porter Cable drill gun to drill tuner holes and a heat gun to warm up braces before I apply hot hide glue to glue the braces to the guitar top. I cut this slot, for guitar sides, in the heel block with a Pax brand back saw and chiseled out the waste by hand. A simple shooting board and a well tuned No. 7 Stanley jointer plane with a sharp iron is all I need to joint two boards that will make a seam so tight that I am often fooled as to where the joint is among the growth rings. The binding channels I cut by hand. Yes, I have a brand new router and a very expensive jig attachment, but you can quickly ruin a $2000+ guitar in less then a heartbeat if you lose focus and concentration. I am not sure that I am going to use it on the seven string classical guitar that I am currently building. I thinned down this side of Indian rosewood to a sixteenth of an inch with a No.3 smoothing plane and a card scraper. I made it that thin so I could laminate the side to some Alaska cedar veneer. Click here to see photos of veneering these woods together. My point is, yes, you can be accurate with hand tools! But, as I have said before, the best way to be good with power tools is to be good with hand tools first. Duncan Phyfe didn't have an amped up shop, did he? I could be wrong, maybe he had a table saw and a router. I think that we limit our imaginations and capabilities by being tied to a machine that does the work. And I am not sure that William Morris and Gustave Stickley were correct when they said that much of the drudgery of wood working can be eliminated by using power tools. I know planing down stock by hand is a lot of work, but a thickness planer puts a distance between us and our medium. If we distance ourselves even the slightest amount from our own work, will our customers see us as people or the machines that made the work? What really is their perception of that work? Creating is a fundamental part of being a human, a person. It should be fun and enlightening. 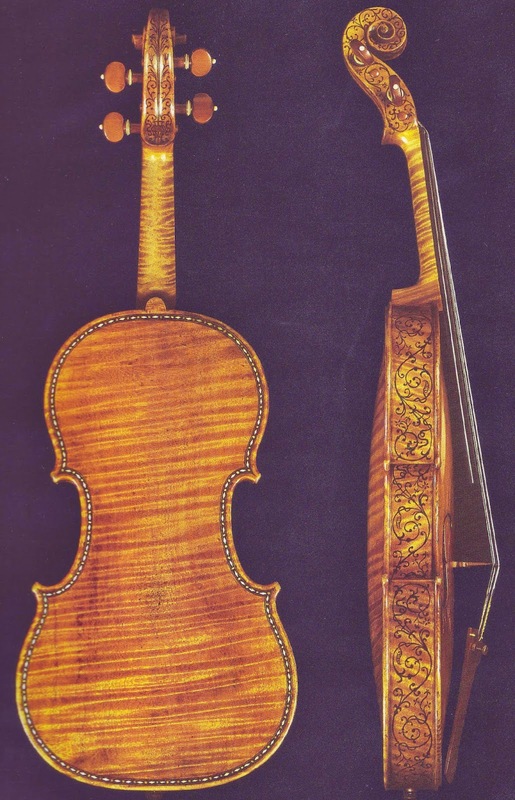 The Hellier Stradivari violin, circa 1679. One last rant--look hard at this violin. How does it affect you when you look at it? Now, after some thought and introspection over this great work, try to convince me that that we as wood workers really need to own and use power tools. Here's a YouTube for your Sunday afternoon! I accept the idea that learning all the processes of woodworking as historically done by hand is a vital training and that hand tools give great intimacy and satisfaction to the woodworker. But, let's take a look at how James Krenov went about some of his work. He was very particular about using a router for the work on his doors. He used a table saw for the corner bridle joints. I've never seen a picture of him using a mortice chisel are read about him morticing with anything other than a router. He band sawed curves and cleaned up and shaped with hand tools. The way I regard his "thing" was that he loved color, wood grain, and composition. Subtle details were very important to his work, but in the scheme of making many of his renowned pieces there was a high degree of fussy and precise workmanship, and machines were definitely at his service. Having met some of his students and read about the instructors at the school he started I don't believe he was a hand tool purist by any stretch of the imagination. The hand tool/machine balance is really a personal issue. It can't be seen as simply one or the other. Professional versus amateur,financial resources,and ways of working are all part of the picture. I endorse embracing anything you feel like and not being apologetic. The important thing is to be engaged and purposeful in your work. The means to do it will sort themselves out. All good points, Tico, thanks! This is a rant I didn't need to post, all this came about from some emails that I received about doing accurate work by hand. I know for my own work on guitars that I personally don't want many power tools around, in my experience they have caused me much heart ache. The fewer, the better. When I am on a historic preservation job I do use power tools when appropriate, otherwise I use the proper hand tools. The thing that I missed with this post is wood working, creating, really, is one of the greatest things that a person can be occupied with. One of these days I am going to take the plunge and make a copy of Segovia's 1912 Ramirez with just hand tools, no drill press, no table saw, no router. It will be a challenge.